My husband was pleased, the color is great. ( orange ) I am happy with quality just wish it was a bit larger. I can not complain the price was excellent. Make a statement in your bedroom with Intelligent Design's Sabrina Comforter Set. Flaunting a large damask print, this beautiful comforter creates a striking contrast with a vivid splash of color. The matching sham echoes the elegant pattern seen on top of the bed, while a solid flange provides a finishing touch. Machine washable for easy care, this chic comforter set is made from ultra-soft microfiber for long-lasting comfort and style. Coordinating decorative pillows feature intricately embroidered details to complete this captivating look. 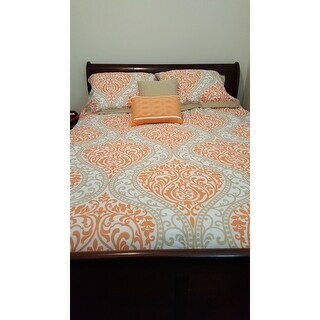 This Intelligent Design Sabrina Comforter Set King Size, was just what I was looking for as far as color. It is beautiful. 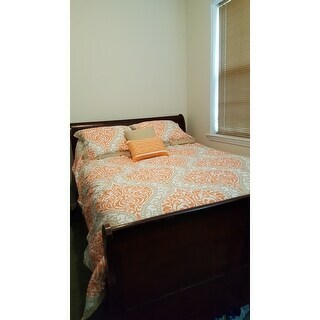 The wonderful Comforter has a large damask print with a gorgeous orange and grey color palette. The Damask print stands out from a white background and matches my room perfectly. It really makes a statement. It is made from ultra-soft microfiber and is not to heavy so its cozy. It keeps you warm but will not make you over overheat. 100-percent polyester fabric is hypoallergenic and machine washable for easy care. The matching sham echoes the elegant pattern seen on top of the bed, while a solid flange provides a finishing touch. Coordinating decorative pillows feature intricately embroidered details to complete this captivating look so everything fits together for a perfect bed ensemble. This set is bold and bright and is true to size on my king-size bed. This Intelligent Design Sabrina Comforter Set includes: 1 Comforter, 2 Shams, and 2 Decorative Pillows. I highly recommend this wonderful comforter set. I am very please in its look and its usability. The picture of this comforter does not do it justice. The orange is beautiful, vibrant, crisp, and refreshing. 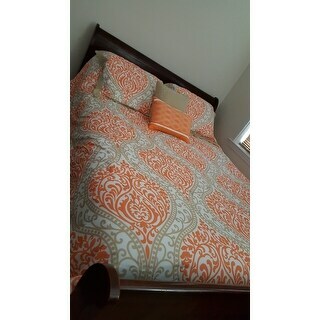 With the shams and extra pillows it looks fabulous on my bed. I purchased curtain panels in the same colors with very close design. It looks like they were made for each other. love this set. It is so vibrant on the bed it brightens up the entire bedroom! A must have! Love the colors and design of this comforter and sham. Great buy! I really did not think that the comforter would feel as soft as it is I had that WOW!!!!! moment, and the color is just right the orange is true to color, and it's reversible, the accent pillows just added that extra little touch, the two pillow shams, comforter and the two accent pillows was just enough to give the room the change it needed and the comforter will keep you warm as well . this was a great purchase and a great way to brighten up the room without spending an arm and a leg to do so. 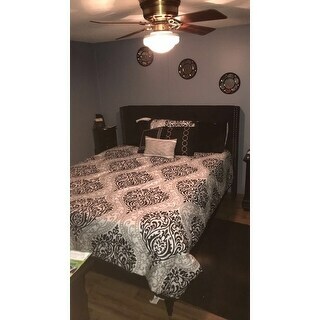 Just received this bed set today and I must say it is gorgeous! After reading previous reviews I decided to step out of my comfort zone and order the orange and taupe set. It brightens up my bedroom with a lovely pop of color. I am now waiting on the matching shower curtain to arrive tomorrow. This comforter seems to be well made even though it is a little on the light side. The decorative pillows are also beautiful. The only con I have is no bed skirt. I has a brown one from my previous set that goes well but if you do not have one you will probably want to purchase one separate. This set matches my bedroom decor and is very pretty and comfortable. I ordered the set in black and white. It is even prettier than pictured. 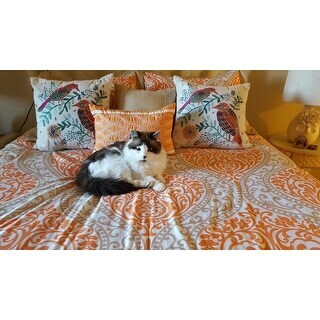 The comforter, shams and decorative pillows are good quality and I am so happy I made this purchase. I bought this comforter for our master bedroom. The color are exactly as depicted in the photo description. The comforter is lightweight but warm. If you like weight in your comforter then this is not the one for you. The set comes with beautiful accent pillows that look great on our bed. I love this comforter! It’s comfy and soft and not too thick but warm enough for the night! I like the print on the comforter. It came with everything, the pillow cases and three throw pillows! Cheap material. colors bled in washing machine . I know have a weird gray color where the white was. Do not recommend. This item isn’t the highest quality but the colors were what I was looking for. It will serve the purpose for now. If you want higher quality fabric and construction I wouldn’t buy this, but if you want something that will work for a reasonable price then this might be for you. I love this set!!! Makes my bedroom a happy place. My friends complimented my bedroom. I absolutely loved my set! I bought this back in 2014 and still love using it! Beautiful comforter set. Perfect for the sumner season. I ordered 2 comforter sets, one black, one turquoise. I absolutely love both of them. The material is very soft , good quality material and the price was very reasonable. I would definitely recommend this purchase. Love it ! Looks and feels amazing. Good quality. Colors are vibrant. Fits queen mattress perfectly. This is a very nice comforter set for the money. The pillow shams will not close all the way in the back if you use thick pillows, but other than that, it is a well-made ensemble. Bought 2 in this color to go with a grey bunk beds with a pull out. Very pretty an looks great in the spare room that has light grey walls. Bought a third for the pull out bed in teal. Works for boys or girls. This is a comfortable set. Your snuggle game will be fierce in this set.We absolutely loved this set. It arrived on time and it looks as advertised. I bought this set for my bedroom. It is very pretty and I have had many compliments on it. The weight is just right. The conforter was true to picture. Light weight, not for cold nights. Fabric is a little slippery. Not cotton. I kept the comforter because colors matched my decor. "My kid has full size bed would the Full-Queen be too big? Whats the difference between full and full-Queen? Thanks Arlena"
FULL/QUEEN will fit both a full and queen bed. SET INCLUDES 2 STANDARD SHAMS 20X26+2" (2), 2 DECORATIVE PILLOWS 12X18"/16X16", 1 COMFORTER 90X90"
"Is this a duvet cover ?" This set comes with a comforter. "What is the fabric content?" Its cotton. I will add its pretty thin we had it for maybe a year and it started to become see through in areas. great for a guest bed not for a everyday sleeping with. "I only see one measurement for shams. Will they fit king size pillows?" I see it now. Didn't scroll far enough! "There is no bed skirt, do u have one for this set?" No, I did not receive a bedskirt. Maria R. Beautiful rich green color. I ordered a gray one to go with it. I have a sleigh bed so I do not use bed skirts. However, I think a white one would like nice with this set and be fairly easy to find. "WHERE IS THIS SET MADE?" This item is made in China. "Is this set true to size for a Queen? I have had issues when the size says full/queen that it doesn't have the coverage I like for my queen. Thanks for any answers? I love this for FALL." I bought it in king size and it fits perfect! I purchased this for a Full size bed. It was an accurate fit as advertised.